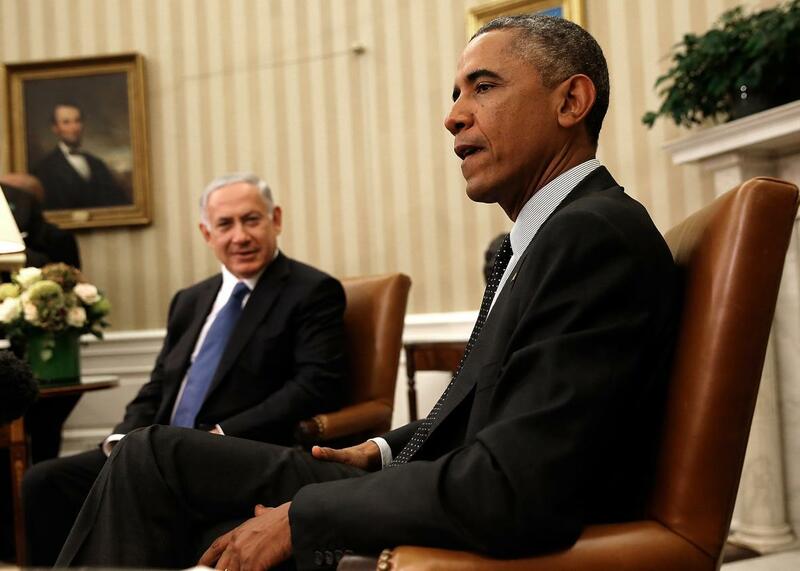 U.S. President Barack Obama (R) meets with Israeli Prime Minister Benjamin Netanyahu (L) in the Oval Office of the White House October 1, 2014 in Washington, DC. President Obama today spoke directly to American Jews in a webcast address cosponsored by the Jewish Federations of North America and the Conference of Presidents of Major Jewish Organizations today. The event was something of a response to an address by Benjamin Netanyahu earlier this month, in which the Israeli Prime Minister made his case against the nuclear agreement with Iran currently under consideration by Congress. Obama made the now familiar case that the deal “doesn’t rely on trust, it relies on verification” and that supporting it does not require trusting Iran’s intentions. He said that disagreement between the U.S. and Israeli government over the deal “does not affect the core commitments we have to each other” and that “the commitment to Israel is sacrosanct and it is non-partisan. It always has been and it always will be.” Speaking to fears in Israel and the Jewish community about anti-Semitic rhetoric from the Iranian government, the president said, “I think that as an African-American, I understand that history teaches us that man can be cruel to man and you have to take threats seriously. But history also teaches us that sometimes the best security is to enter into negotiations with your enemies. Obama has made many of these points before in press conferences and speeches since the deal was signed. The administration’s aggressive sales pitch for the deal has been premised on the notion that if critics only fully understood it, they would realize that it’s the best choice for the security of the U.S. as well as Israel. As the president told viewers today, “the more information, the more confident you’ll be that this is the right thing to do.” As I’ve written before, I think this premise is flawed. No realistically conceivable deal was ever going to satisfy the critics now arguing against it. This opposition is not based on the specifics of the agreement. In part, it’s knee-jerk partisanship and pandering—at the moment it looks as if not a single Congressional Republican will support the deal—as well as an honest disagreement about the nature of the Iranian regime. President Obama and the agreement’s supporters believe that for all their many flaws, Iran’s leaders are rational actors who can be influenced through incentives. Netanyahu and opponents of the deal believe they are ideologically-driven, inveterate antagonists of the U.S. and Israel who will take any opportunity to cheat on their nuclear commitments and provoke terrorism. Given this seemingly unbridgeable divide, as well as the fact that the deal now seems almost guaranteed to pass, it’s odd that Obama is even bothering to make such an aggressive sales pitch. Part of the reason, as shown by today’s event, is that many of the deal’s most prominent opponents are American Jewish leaders and organizations, many of whom have long suggested that this administration is less than forthright in its support for Israel—an allegation that clearly makes the administration uncomfortable, no matter how ludicrous they may find it. The debate over the deal has spawned a side debate over whether proponents of the deal have indulged in coded anti-Semitism by suggesting that opponents don’t have America’s best interests in mind. Some have also suggested that all the attention on the Jewish affiliations of anti-deal members of Congress like Chuck Schumer and Steve Israel crosses a line by suggesting that American Jewish leaders have dual loyalties. This is silly. It’s not exactly a mystery that opponents of the deal have targeted Jewish members of Congress as well as those like Cory Booker and Bob Menendez of New Jersey who represent significant Jewish constituencies. With AIPAC spending a record $1.67 million this year as it has lobbied against the deal, it’s hard to pretend pressure from pro-Israel groups isn’t a factor in this debate. Baseless or not, the White House would presumably like to avoid the impression that it’s blasé or even hostile to Jewish concerns, particularly heading into an election season where Obama and his former Secretary of State, Hillary Clinton will be repeatedly bashed on the campaign trail for abandoning U.S. support for Israel. On the other hand, it’s the Jewish community as a whole isn’t actually that concerned about the deal. At least one recent poll suggested American Jews are more likely to support it than non-Jews. Despite the opposition of some very prominent and vocal Jewish groups and representatives, the vast majority of American Jews are Democrats. As the president put it today, “I wouldn’t be sitting here if it weren’t for friends and supporters in the Jewish community.” That may not continue forever, but given polls showing younger American Jews with less of an attachment to Israel than their parents, Netanyahu may ultimately have the bigger outreach problem.